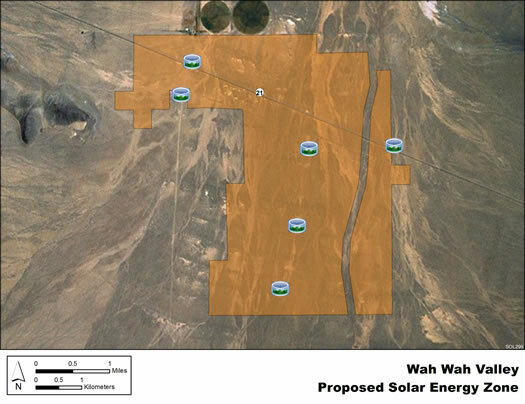 The Wah Wah Valley solar energy zone (SEZ) is located in Utah northwest of the Escalante Desert. The SEZ is located on BLM-administered land within the Cedar City Field Office. The Wah Wah Valley solar energy zone (SEZ) has a total area of 6,097 acres (25 km2). In the Supplement to the Draft Solar PEIS, 224 acres (0.91 km2) of the Wah Wah Wash were identified as non-development areas, leaving the SEZ with a potential developable area of 5,873 acres (23.8 km2). No additional changes to the SEZ developable area were made in the Final Solar PEIS. The Wah Wah Valley SEZ is located in Beaver County. The SEZ lies in Wah Wah Valley, a narrow valley northwest of the Escalante Desert across the Shauntie Hills, and between Wah Wah Mountains to the west and southwest, Shauntie Hills to the south and southeast, and San Francisco Mountains to the east. In 2008, the county population was 7,265, while adjacent Iron County to the south had a population of 45,833. The largest nearby town is Cedar City about 50 mi (80 km) southeast. Land within the SEZ is rural, undeveloped scrubland characteristic of a high-elevation, semiarid basin. Vegetation consists primarily of low shrubs with broad expanses of gravel and sand flats. State Route 21 passes through the northern portion of the SEZ. A ranch with some land under irrigation is located at the northern boundary of the SEZ. An historic power line, unpaved roads and wire fences cross the SEZ. Part of the SEZ is authorized by the BLM for grazing. The SEZ may be used by local residents for general outdoor recreation, including backcountry driving and off-highway vehicle use, recreational shooting, and small and big game hunting. Mountains surround this remote location, and there are few people living nearby. There is good access to the SEZ from State Route 21, which runs from west to east through the northern half of the SEZ. Transmission access to the Wah Wah Valley SEZ does not exist. The availability of existing transmission near the SEZ is under investigation, but there is a designated transmission corridor running east-west through the SEZ along State Route 21. As of May 2012, there were no pending solar applications within the SEZ.